The JBL Boombox definitely puts the boom back in boombox with its big sound and easily earns a Top Pick of 2018 Award here at Techaeris. Boombox: noun, informal “a portable sound system, typically including radio and cassette or CD player, capable of powerful sound.” If you’re like me, and you hear the term boombox, you’re likely taken back to your youth and the boomboxes of the 80s/90s. 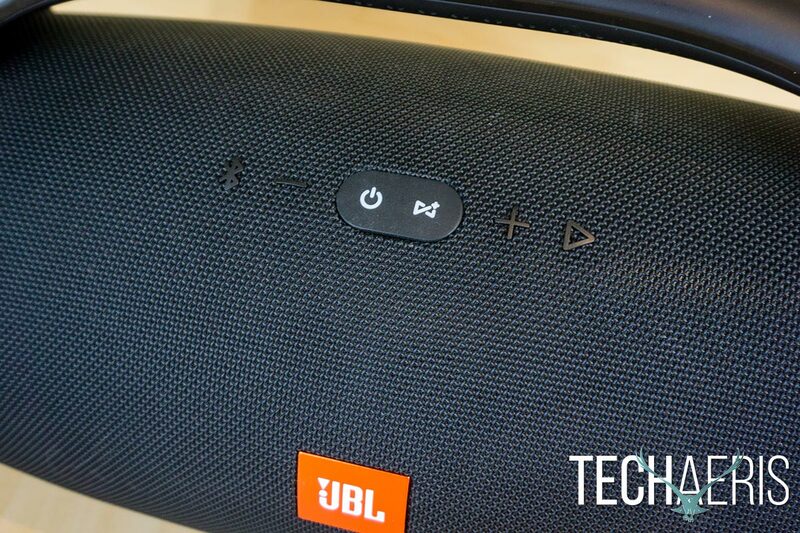 We’ve reviewed a few JBL products over the past few years and the JBL Xtreme Bluetooth speaker remains a personal favourite, especially for outside use and camping. 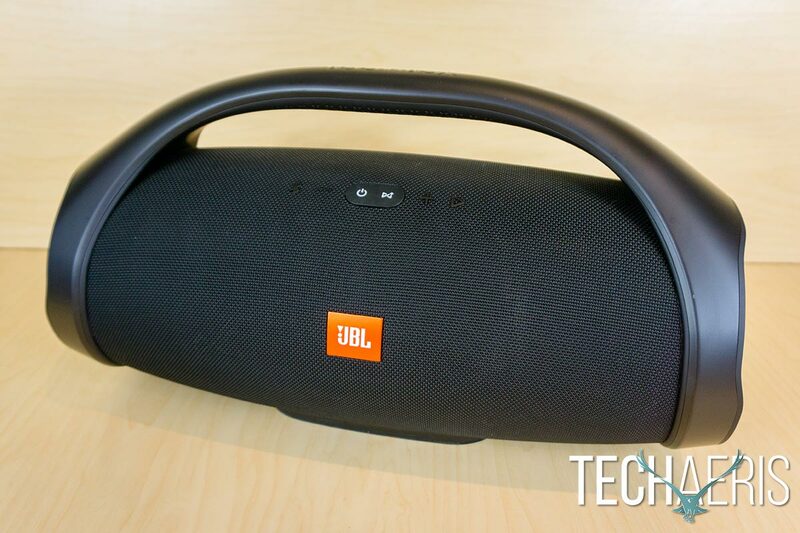 It turns out that JBL has one-upped the size on that and our JBL Boombox review takes a look at one of the larger portable Bluetooth speakers you’ll see. Read on to see how it stacks up! 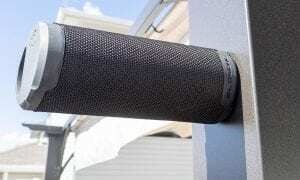 The JBL Boombox starts off with the familiar woven fabric cylindrical JBL Bluetooth speaker design. 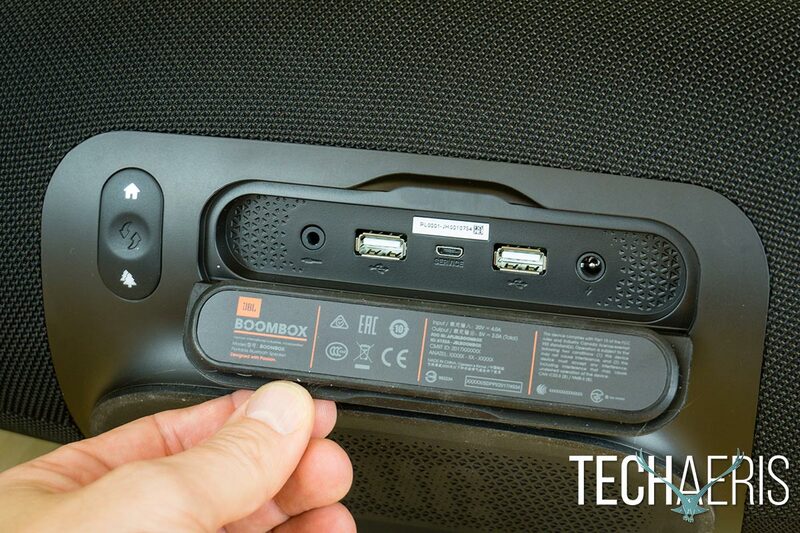 The equally familiar JBL orange square logo is planted square on the front of the speaker. Above the logo are the controls which include (from left to right) Bluetooth, -, power, JBL Connect+, +, and play. The cylindrical speaker portion is wrapped with solid black plastic rings with a wavy type design around either end which are molded into a single handle that arches up over the top of the speaker. The handle is definitely needed and makes this beast of a speaker easy to carry around. While the JBL Xtreme had a detachable shoulder strap, the handle is a much better and more functional design choice. Along the top of the handle, the word BOOMBOX is debossed in the top while the underside of the handle is nicely textured for added grip. The handle is definitely needed for a speaker this size. The ring on either end of the speaker is capped with a hard rubber piece which is a nice design consideration and should help prevent accidental damage from the odd bang or bump. Centered inside this ring is, of course, JBL’s 4-inch woofers — one on either side. The center of each woofer has a textured metal plate with a smooth shiny bezel around the outside. The JBL logo is printed in the middle of each metal plate. The woofer on one end of the speaker. The back of the speaker has another plastic piece which wraps around the bottom and not quite so far up the front of the speaker. Inset into this piece on the back is an indoor/outdoor toggle button with a house on the top (for indoors) and a tree on the bottom (for outdoors). To the right of this is a large rubber door. Flipping this open, which takes a bit of effort due to the needed tight seal to make the speaker IPX7 rated, exposes a 3.5mm audio jack, two USB-A ports for charging devices, and the round power adapter port. Centered between the two USB-A ports is a Micro-USB port for firmware upgrades only. The indoor/outdoor mode button and available ports. 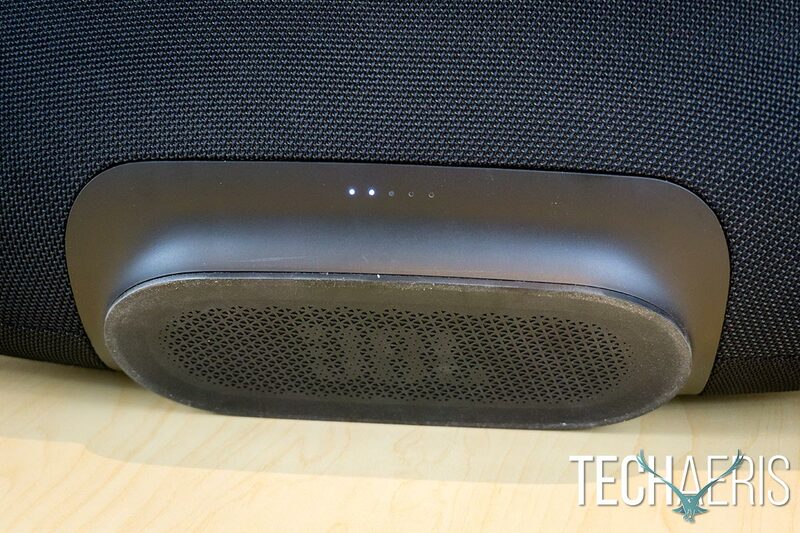 The plastic extends down and extrudes into a flat ovalish shape on the bottom of the JBL Boombox. The entire bottom of this piece is covered with a textured rubber piece which gives a pretty solid grip when the speaker is placed on a flat surface. On the front of the bottom base are five small LED lights which light up to indicate remaining battery life. Overall, the JBL Boombox design doesn’t stray too far from its other outdoor speaker siblings and is still a solid looking Bluetooth speaker with a rugged yet sleek look. Given the size of the speaker the addition of a handle and the solid base for setting it down are not only needed but solid design choices. The one thing that the speaker is missing, however, is a previous track button but that’s something that’s also missing on the Xtreme, and I suspect other JBL Bluetooth speakers. As far as Bluetooth speakers are concerned, there’s nothing new here. Power on the speaker, press the Bluetooth button and the power button will blink blue. Look for JBL Boombox on your device in your Bluetooth settings and select it to pair. Once paired, the power button turns a solid blue and you’re good to go. Once you’re paired, pressing the play button plays or pauses the track while double pressing it skips to the next track. As mentioned above, there is no way on the speaker itself to skip back to the previous track. It’s a minor inconvenience as you can use your phone but if you’re poolside and your phone is safely hidden away in a bag or somewhere dry, you’ll be stuck with the current or next tracks and not be able to go back to a previous favourite. 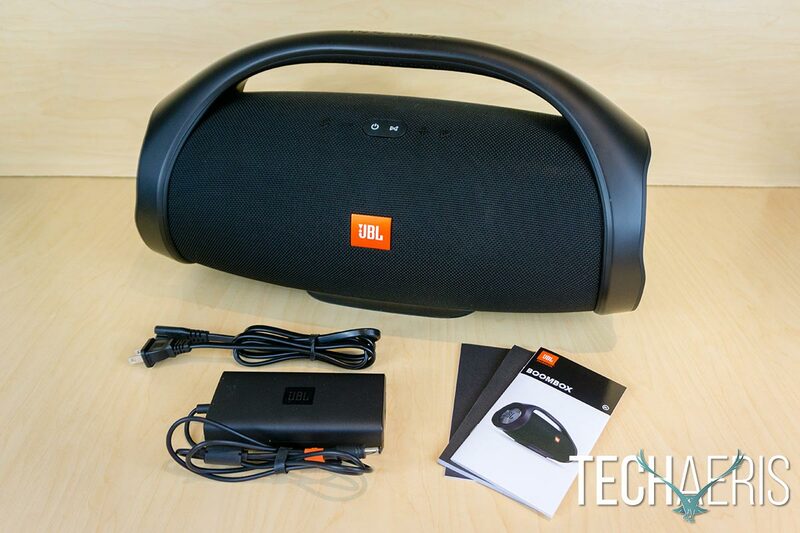 The JBL Boombox is easy enough to use, but there’s no previous track button. When power is on, the power button lights up. Likewise, the indoor and outdoor icons light up accordingly so you know which mode it’s in at a glance. When you have Connect+ enabled, the Connect+ icon is solid white when it’s on and in broadcasting mode. 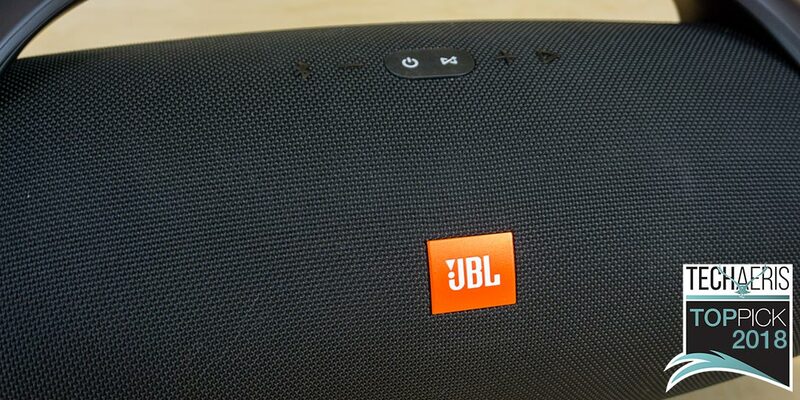 While it’s not required, the JBL Connect app does make some things a bit easier with the JBL Boombox, especially if you have multiple JBL speakers around. JBL Connect+ allows you to wirelessly link over 100 JBL speakers together for ultimate party mode. If you happen to have two JBL Boombox speakers, you can set one as the left channel and the other as the right channel for stereo output. 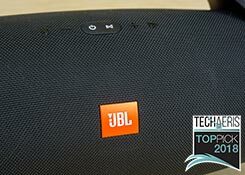 Unfortunately, I was unable to test this as the JBL Xtreme supports JBL Connect but not JBL Connect+ like the newer JBL Boombox. 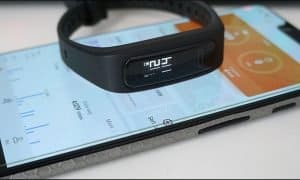 Finally, you do require the JBL Connect app to enable Siri or Google Now voice assistant functionality. When you enable voice assistant through the app, the Play/Pause button is used to enable your voice assistant. While it does pause the music playing, it does enable the voice assistant at the same time. Pressing it again will continue to play your music and stop the voice assistant from listening, but it is a bit of an odd setup as even if you want to pause the music for a minute, you’re still enabling Google Now or Siri. As for the rest of the app, it’s pretty basic. You can toggle the audio feedback sounds for button presses, as well as toggle between indoor and outdoor sound modes. I suppose the latter is useful if you’re some distance from your speaker and have your phone handy. Finally, you can check the basics of your speaker like the firmware and app version. It’d be nice if there was an equalizer built into the app as well, however most devices have one. As you’ll read in the next section, however, one really isn’t needed. As I mentioned before, the JBL Xtreme is still one of my favourite Bluetooth speakers. I mentioned that before and again because, well… simply put the JBL Boombox absolutely blows it away and demolishes it when it comes to sound. Sure, it’s bigger and pricier, but the size and price for the sound that the Boombox throws out is well worth it. When playing the Xtreme, then the Boombox, there’s no comparison. Heck, I don’t think I’ve heard a Bluetooth speaker sound as good as the Boombox does. The JBL Boombox is simply rich and balanced with deep, big bass that doesn’t overpower the mids and highs. Inside, you’ll be fine with around 25-30% volume for normal listening and would be hard pressed to have it cranked to 100% for any amount of time. Even at that volume, audio is clear and crisp and you can really feel the bass as well. Even outdoors at 100% volume is rather loud and it will really depend on the space you’re entertaining in to be able to effectively utilize the speaker at maximum volume. Every genre of music I put through this from rock to hip-hop to reggae and even some classical and everything in between sounded fantastic without any need for equalizing. The speaker does have an indoor and outdoor mode and there is a definite difference when toggling between the two. To be honest, I did find that I preferred the outdoor mode even when indoors as it seems to throw the sound a bit more and, in my opinion, that resulted in a better and more enjoyable soundstage for listening to. 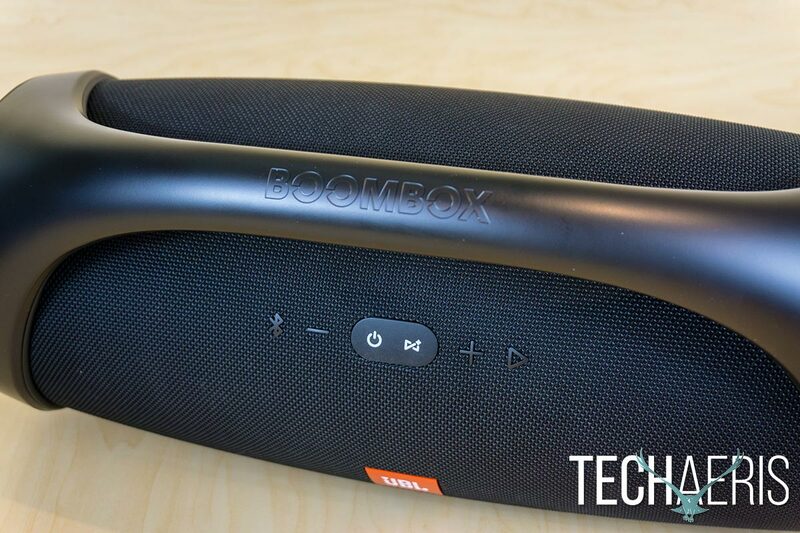 As far as reception is concerned, the JBL Boombox uses Bluetooth 4.2 so has a pretty decent range when it comes to connecting and streaming from your smartphone. I had no issues with being anywhere in my backyard and still having a connection to the speaker. As a test, I walked up the street a bit as well and got to about 4o feet away before the signal started to become intermittent. As far as call quality, the speaker works well enough for calls assuming you are fairly close to it so the other party can hear you clearly. Of course, a monster-sized speaker needs an equally monster-sized battery. The JBL Boombox has a 74Wh battery which the company claims will last up to 24 hours on a single charge depending on music listened to and volume used. 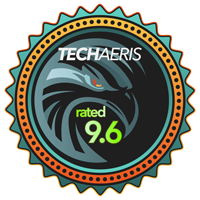 During our testing, and trust me it was hard to test battery life at 100%, we listened to the speaker over the course of a few weeks at varying volumes which normally peaked around the 50% level. As such, we were able to get around the 24-hour mark more than once and a couple times crept barely over it. During our 100% volume tests, battery life was definitely impacted and the speaker made it about 17 hours at full volume before needing to be recharged. While it’s not the full 24 hours, 17 hours at 100% is still decent, considering how loud the speaker is at that volume. To be honest, it’s not going to be a situation you’ll likely encounter needing to use the speaker that long at that volume as even 40-50% volume is nearing levels that make conversation difficult. 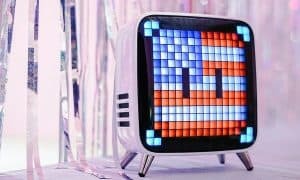 The base of the JBL Boombox includes five LEDs to indicate remaining battery life. As far as recharging the speaker goes, you’re looking at about 6-7 hours to fully recharge it once it dies. Big sound and all-day battery life doesn’t come cheap though. With an MSRP of $449.95USD, the JBL Boombox can currently be had on Amazon for as low as $418.98. Honestly, at either price, it’s well worth it considering the massive soundstage and battery life. Sure, the smaller JBL Xtreme is decent as well but has an MSRP of $299.95 (it can be found as low as $200 on Amazon), but if you’re after big sound even two Xtremes won’t sound as good or as loud as one Boombox. The JBL Boombox definitely puts the boom back in boombox with its big sound and easily earns a Top Pick of 2018 Award here at Techaeris. Sure, it’s large — and a bit on the pricey side — but if you’re after loud, bass-booming, all-day and night party sound, the JBL Boombox easily fits the bill! 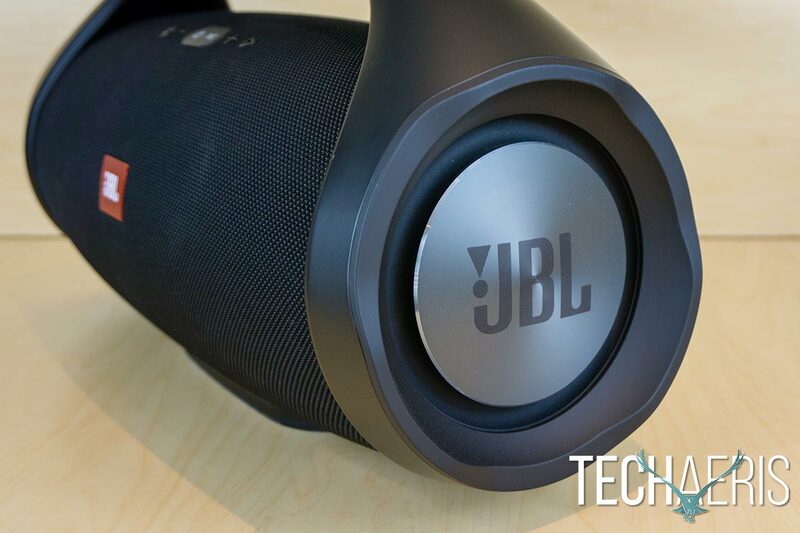 *We were sent a review unit of the JBL Boombox for the purposes of this review.